You are at:Home»Herbs»Commiphora mukul Hook. ex Stocks. Commiphora mukul Hook. ex Stocks. Description : Guggul is alterative, analgesic, anticholesterolemic, antiinflammatory, antiobesity, antioxidant, antiseptic, antispasmodic, aperient, astringent, carminative, demulcent, deobstruent, diaphoretic, emmenagogue, expectorant, nervine, rejuvenative and stimulant. It is a very effective herbal medicine for controlling obesity and cholesterol. Ketone fraction that is extracted from the oleo-gum-resin contains the most potent cholesterol lowering components. The extract isolates ketonic steroid compounds are known as guggulsterones. These compounds have been shown to provide the lipid-lowering actions noted for guggul. 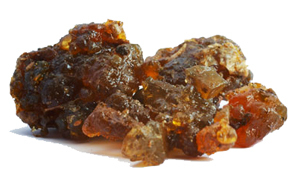 Guggul significantly lowers serum triglycerides and cholesterol as well as LDL and VLDL cholesterols (the “bad” cholesterols). At the same time, it raises levels of HDL cholesterol (the “good” cholesterol). Guggul has also been shown to reduce the stickiness of platelets-another effect that lowers the risk of coronary artery disease. Guggul are an effective herbal weight loss supplement which helps lowering down overweight. It is useful to remove stubborn fats deposited around waist, thighs and buttock. It reduces high cholesterol from the arteries and thereby cleaning them. This wonderful product also provides strength to the joints and nervous system. It helps in fighting various degenerative, inflammatory and other wear and tear conditions. Guggul Capsules are prepared from the gum resin obtained from Commiphora mukul tree. It is purely a natural substance and helps lowering down overweight without causing any adverse side effects. Guggul Capsules are pure, vegetarian and natural supplements which contain standardized extracts of Guggul for giving accurate results. This product is mostly recommended due to ‘ushan virya’ potency of guggul as its ‘katu’ and ‘tikhta’ rasa is very beneficial for the obesity related problems. Recommended Dosage : 500 mg to 1 g powder of purified exudate. Contraindication : The gum is reported to enhance the menstrual discharge and hence should not be taken in pregnancy. Avoid during breat feeding and if suffering from irritable bowel disease or diarrhoea. As it stimulates the thyroid so best avoid in hyperthyroidism. In rare cases it can cause allergic skin reaction.